A new vaccine for cattle and sheep delivering the broadest possible protection against clostridial diseases has been launched by Intervet/Schering-Plough Animal Health. 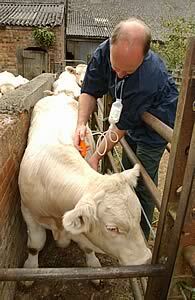 Bravoxin 10 is a highly effective, low dose broad-spectrum vaccine that will protect both cattle and sheep from clostridial diseases like blackleg, pulpy kidney, braxy, and black disease, as well as other conditions caused by clostridial bacteria that usually kill the animal once infection has become established. The new vaccine protects against disease caused by the 10 main clostridial bacteria; C. perfringens type A, C.perfringens type B, C.perfringens type C, C.perfringens type D, C.novyi type B, C.septicum, C.tetani, C.sordellii, C.haemolyticum and C.chauvoei. Commenting on the launch, Intervet/Schering-Plough Animal Health ruminant veterinary adviser Rosemary Booth MRCVS said that clostridial diseases continue to be responsible for a huge number of costly cattle and sheep losses on UK farms. “Clostridial bacteria take the lives of cattle and sheep on a regular basis and are the cause of a significant proportion of the sudden livestock deaths in this country. For example, in 2007 an independent survey of over 500 UK dairy and beef farmers revealed that half the interviewees had experienced calves or adult cattle dying for no apparent reason. The reality is that many of these losses could have been due to clostridial diseases. Farmer respondents valued the livestock loss at anywhere between £505 and £1243 per animal. Even at the lowest stock valuation, preventing the loss through broad-spectrum vaccination would pay for nearly five years of Bravoxin 10 use in a 100 cow herd,” she said. Rosemary Booth stressed that clostridial bacteria share the same environment as livestock and are ever-present – existing in soil, on pasture, within buildings and even in the tissues and intestines of cattle and sheep. Consequently, improved farm biosecurity measures will be of no benefit in controlling this group of diseases. The sheep industry already recognises the importance of broad-spectrum vaccination against clostridial diseases, but Iain Carrington from Intake Veterinary Services based in Northumberland believes cattle producers should also upgrade their protection. “There was a time that clostridial disease control in cattle meant vaccinating your youngstock against blackleg at turnout, or discovering dead animals and then reacting with blackleg vaccine,” he said. “But over the last few years, I have seen an increased incidence of different clostridial diseases in far from typical circumstances. “There are also a large number of cattle deaths going undiagnosed and it is likely that many are caused by clostridial species. As a result, we are now advising many of our clients to take a broader-spectrum vaccination approach to ensure adequate protection – not only of the cows themselves – but also their calves through good colostral transfer,” he said. Bravoxin 10 is a prescription-only medicine (POM-V) and farmers should talk to their vet about vaccination regimes. For further information, contact the Intervet/Schering-Plough Animal Health Veterinary Support Group on 01908 685685.